Having a swimming pool to laze around on a hot summer day can be one of life’s simplest pleasures. If you have been considering putting in a pool, you may have heard that a salt water pool is less maintenance than a traditional chlorine setup. With a chlorine setup, you have to deal with making sure that you regularly add chemicals to your pool. Those chemicals can also be costly and need to be stored safely away from your kids. Another issue is dealing with the dry skin and burning eyes, that chlorine often causes. A salt water pool requires less maintenance, but you also will pay for it more upfront. A common misconception is that salt pools don’t have chlorine in them. Yes, you don’t physically add chlorine, but the salt water generator within the system creates chlorine through chemical electrolysis. The levels of chlorine in a salt pool are usually lower than what you will find in a regular chlorinated pool. While you might need much daily maintenance or to spend a lot on chemicals with a salt pool, you’ll need to run your salt water generator often, sometimes constantly during hot weather. The other issue is that salt is corrosive; it can damage your deck and destroy the lawn surrounding your pool area. 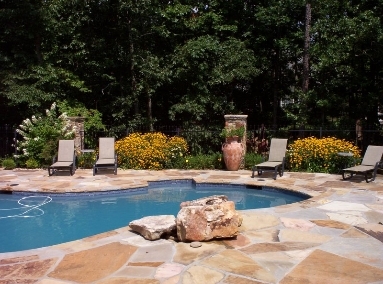 You may want to consider going with a hardscape around your pool instead of wood or grass because of this. When deciding between chlorine and salt water, consider which system better suits your needs, for both now and in the future. If you plan to use your pool for a long time give our design experts a call to create the perfect pool experience for you.